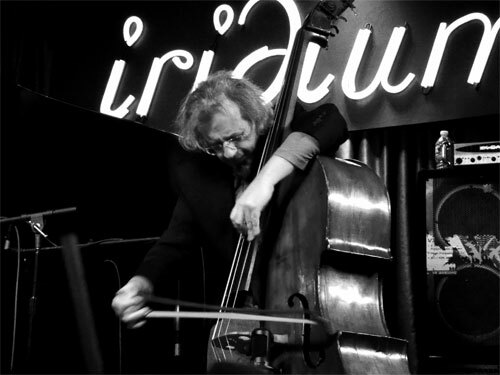 Matthew Shipp played two sets with his current trio at New York’s Iridium the night of Thursday, January 13, 2010, in advance celebration of his latest CD, the two-disc live set Art of the Improviser, which Thirsty Ear, the label he’s recorded for, and supervised the Blue Series jazz catalog for, since 2000, will release February 22. That set includes one solo disc and one with this group, which has been together since September 2009 and includes bassist Michael Bisio and drummer Whit Dickey. In performance, whether solo or leading the trio, Shipp offers a torrent of music, a single nonstop medley of his own compositions, standards, and intensely focused improvisation. There’s no showbiz to it, just pure music, and the first set at Iridium was no exception. The performance began with a brief solo passage, a melody Shipp has never recorded. Bisio entered after a minute or so, and Dickey was the last to join in. Throughout the set, he was hitting extremely hard and playing with great aggression, slashing at the cymbals and thwacking the snare with sufficient force to make it seem regrettable on the club’s part to have surrounded him with as many microphones as he had. Given the size of the space, they were quite unnecessary. As the music gradually gained steam, the melodies coming from the piano were hypnotic and relatively unadorned—he wasn’t doing much in the way of wild soloing, just building intensity with variations on his themes. Around the 15-minute mark, Bisio took a solo, bowing the bass with great vigor and fervor. He played a bluesy melody with the bow, lifting one foot off the ground and seeming almost entranced, as Shipp sat behind the piano with his eyes closed and hands folded in his lap, rocking back and forth and listening intently. By the end of the solo, things had gotten almost unpleasantly wild, as the sawing and scraping and deep drones went far beyond the realm of conventional beauty and into outright assault on the instrument. When the trio returned to full-on interplay, Shipp launched a series of elaborate interpolations and flurries of notes, much more baroque and convulsive than before. Across the stage, Dickey was going nuts, his snare work positively martial and his kick drum thumping like a hard rocker’s. Eventually, Shipp began hitting one note over and over, percussively, before launching into “3 in 1,” a Shipp melody that always reminds me of “Rock-A-Bye Baby.” The intensity built and built, until he was absolutely hammering the notes home, crashing the keys so forcefully that Bisio actually looked over in surprise at one point; Dickey’s drumming was utterly berserk. At the half-hour mark, it was time for the drum solo, even though it could be argued that Dickey’d been soloing for the whole set. 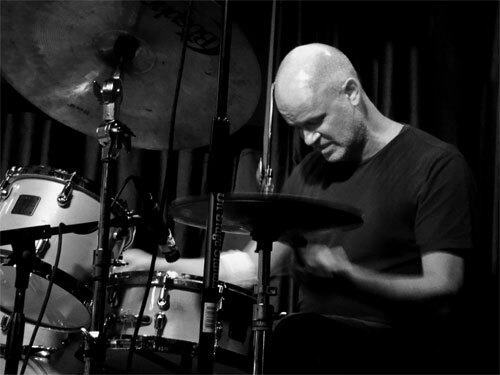 He went quite far out, well beyond the realm of, say, Roy Haynes and into total John Bonham/Ginger Baker territory, occasionally melodic but basically assaultive and over-the-top, and because of Shipp’s marathon performance style, there was no time to catch one’s breath—the machine just kept rolling along. The hour-long set’s second half began in bop/standards mode; the group played “Fly Me to the Moon” and “What is This Thing Called Love,” with Shipp going deep into a Thelonious Monk-ish mode, hitting lots of seemingly wrong notes and thumping out chords as though playing with his elbows, not his hands. He also kept up the fast flurries of sound, essaying multiple high-speed runs as the rhythm section shifted back and forth between a loose, free swing and more independent action. This was one of the few times that Bisio and Dickey genuinely seemed to be working together. If trios necessarily divide into two-against-one, the piano and bass were definitely the two for this performance, with Dickey off on his own, head down, eyes closed and sticks flying. The set wound down with a version of “Virgin Complex,” from Harmony and Abyss. Bisio bowed the strings again, as Dickey opted for brushes (for the only time during the set) and Shipp reached into the piano to pluck the strings, creating a jagged, harpsichord-like sound. And that was it; after just about an hour (maybe a minute or two more or less), it was over. After Shipp announced their names, the musicians left the stage as quickly and unobtrusively as they’d arrived, leaving the echoes of their emotionally charged, ferociously energetic performance to dissipate, lingering only in the memories of those present. Shipp is a great musician, very cool.